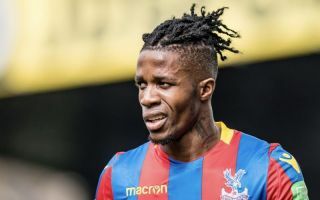 Wilfried Zaha could be on his way out of Crystal Palace with Everton reportedly one of the frontrunners to secure his signature ahead of the new season. The 25-year-old winger has made nearly 300 appearances for the London side during two spells with the club but according to the Daily Mail, Zaha is looking to move onto pastures new. Palace do not want to lose their prized asset on the cheap, however, with The Mail also reporting that the club has lumped a £60 million price tag on the young forward’s head. The Mail also discounts Tottenham Hotspur from the race for the player, after they refused to consider matching the lofty asking price. Spurs also have several good options in his position already, with Erik Lamela now fit again and Lucas Moura added to the ranks back in January. Not to mention Heung-min Son, who has become a key part of manager Mauricio Pochettino’s starting XI over the last couple of years. But Everton have not been deterred by the price tag and look set to rival Bundesliga side Borrusia Dortmund for Zaha’s services, as the Mail also reports.